This is the time of year to check your local hardware stores, Home Depot, Lowes and Tractor Supply. With heating season in full swing you can find all kinds of pre-made fire starters at many stores at a fairly cheap price. Grab a mixed assortment and give them a try. You may very well find your new favorite fire starter. 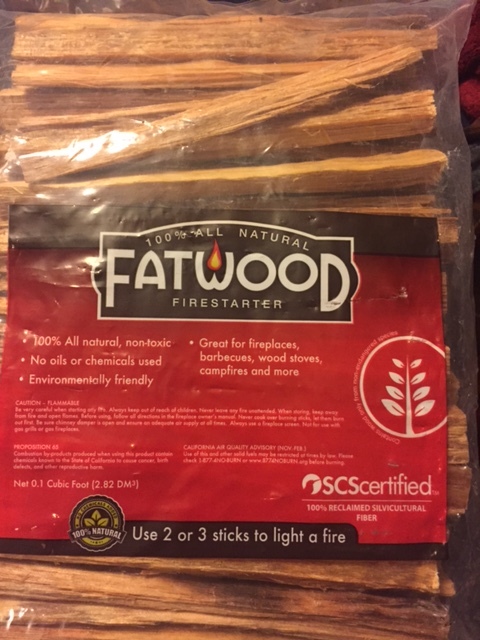 Every year I grab a few of these bags of Fatwood. They are great and easy to use all year long. I found these little gems at Tractor Supply. They are made of Fatwood and wax. What more could you ask for? What are some of your favorite fire starters? When using any type of fire starting rod, make sure to place the tip of the rod on or into the tinder that you are trying to start. Then run your striker down the rod, while keeping the rod still, instead of pulling back on the rod. This will keep the hottest sparks close to the tinder and give you a much better chance at getting the tinder lit. Hope this helps and go out and test your fire starting skills. As always do everything in a safe manner and at your own risk.